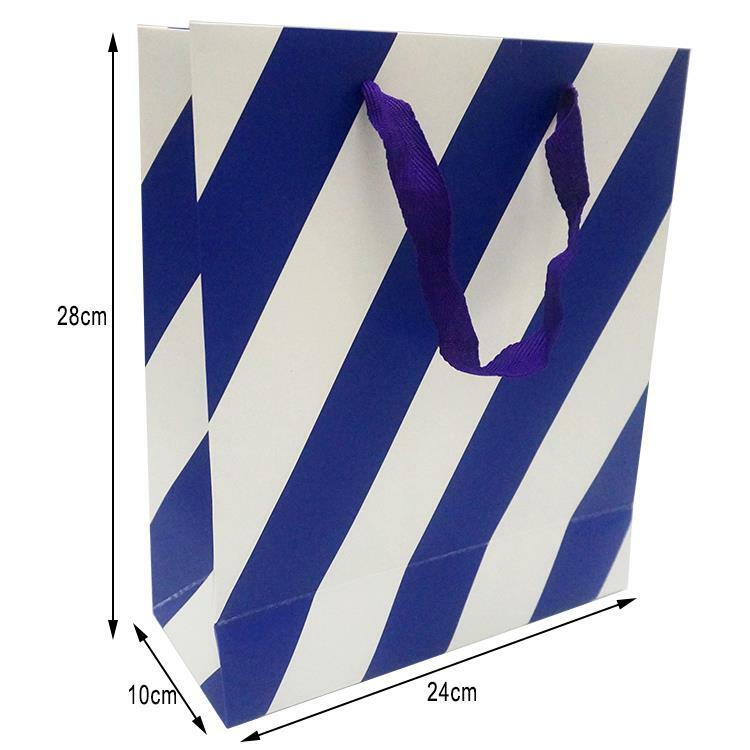 This shopping paper bag with blue stripe has high quality with blue handle, we use 180gsm paper as material to support at least 2Kg weight. Except 180gsm paper, we also adopt hight strength blue handle. Customized service also available. Shopping paper bag with blue stripe are ideal for gift shops and boutiques or for the then/single party/wedding/baby birth celebrations. They do not harm the earth. These bags are completely biodegradable and can be composted, recycled and reused. These paper bags are ideal for storing clothes, paper, cosmetics and other things. 1. Powerful and versatile: With a sturdy rope handle, the bags are flat, so they stand well. 2. Durable: These bags are perfect for craftsmanship and DIY. They are pure blue stripes and can be painted, printed and decorated to your liking. Print your own business logo to make it a unique bag. 3. Sturdy handles: The handle of the paper bag is well attached to the bag. All seals on the bag are very strong and are not easy to open or tear. The large opening accommodates large items. 4. Environmentally friendly: Made from environmentally friendly biodegradable materials. These bags can be recycled, reused and composted. 100% satisfaction guarantee. Suitable for shopping, and sometimes it also regard as gift packaging. The size of this paper bag is medium size.